Kerala is that unique tropical state in the far south of India. Missionary work seems to have begun here as much as 1,900 years ago, as this was the ‘spice coast’ and there was a main Greek trade route here from 200 BC to AD 600, and forms of Christianity began here less than 100 years after the time of Christ. The initiative of Brother C H French (Snr) of the Gospel Publicity League saw our Bible Reading Charts produced in the local language in the 1950s. The Australian Bible Mission started working here, initially through advertising in the early 1980s, and the first baptism, a Brother Rajumon, took place in 1984. Steadily, ecclesias developed here and the ALS Diary currently lists nine ecclesias. 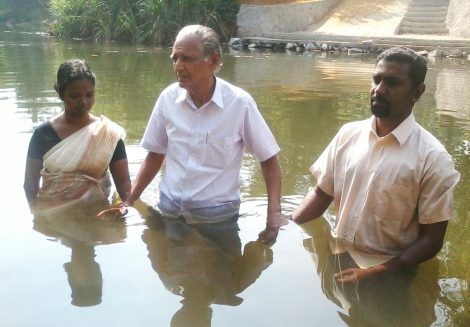 “On 2 March last year, the brothers and sisters of Thiruvalla ecclesia witnessed the baptism of Sister Deepa Samuel, wife of Brother Samuel. She was a regular visitor of this ecclesia for the last few months. She learned the fundamental truth from her husband first and then began to attend our meeting regularly. “On 3 August 2014, we witnessed the blessed heavenly calling into baptism of Mathew M Abraham. We call him Sabu; he became a good contact nearly one year previously and became a regular visitor on Sundays, with other study evenings either in his house or in his office. It is great to see that his family also comes with him to the meetings. Since his baptism Brother Sabu has started some studies with his friends.